Pesticide and similar product are defined as: products or agents of chemical, physical, biological nature intended to defend and protect stored processed agricultural outputs, pastures, native or planted forests, urban and industrial environments from attack by a variety of creatures. Substances classified as pesticides also include defoliants, desiccant, growth stimulator and inhibitors. Component refers to the active ingredient, technical product (technical grade active ingredient), raw material, inert ingredient and additive used for the production of pesticide and similar products. After the amendment under the Law 9974, the collecting, recycling and “triple-washing” technology for empty container were covered under pesticide management. 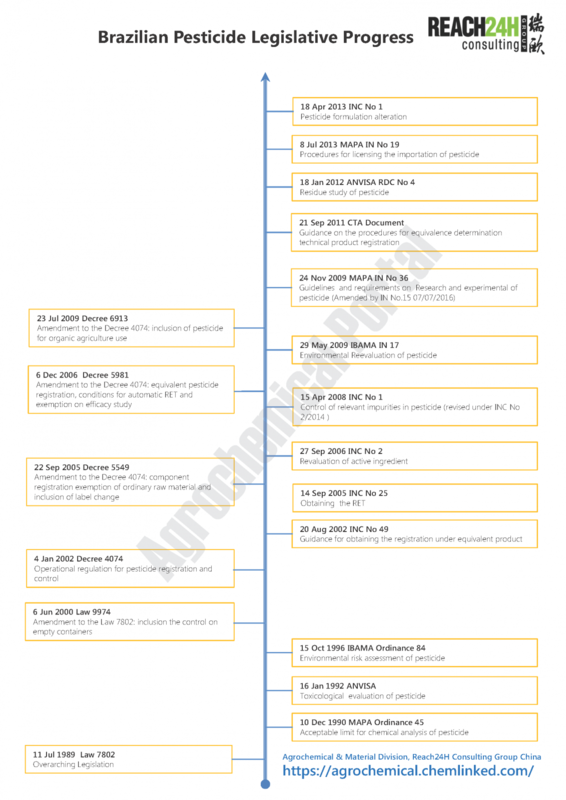 In 2002, the enactment of Decree 4074 specified more operational provisions on the involved authorities, procedures, category, data requirement, templates for pesticide registration. The Decree was revised three times and numerous supporting rules were established by the authorities under various forms, ranging from department/authority ordinance, rules, resolution (RDC), technical note and normative instruction (IN) by single authority to jointly normative instruction by multiple authorities (INC). Directives and requirments of the MoH on the toxicological evaluation, toxicological classification and establishment of maximum residue level and labeling of pesticide. Requirement that the physic-chemical, toxicological, eco-toxicological and other studies which support IBAMA’s pesticide evaluation should be performed in testing facilities monitored under GLP principles. Guidance on technical and administrative procedures for assessing the equivalence determination of technical product. Criterion and procedures for the alteration of formulation of registered pesticides and similar products. Although the Decree 7074 defines technical products (technical material) as components, they shall be registered under product registration. Depending on the product type, novelty and acceptance authorities, the requirements differ. The research and experimentation of technical product, pre-mixture and formulated product should obtain the special temporary registration (RET). Pesticide with RET can be produced or imported under limited volume for the efficacy, toxicology, environment, residue and chemical studies. The agriculture product in the treated area cannot be utilized for food or feed purpose. 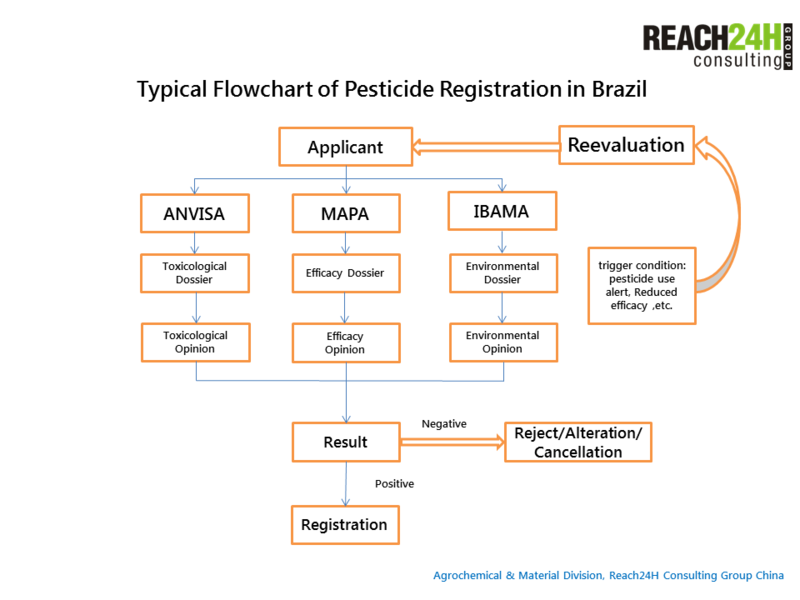 If a pesticide contains active ingredients already registered in Brazil, the RET can be automatically granted by the registration authorities. According to the condition, area of the activity, study plan, the research and experimentation are classified in to three stages. The inert ingredient , additive and specific raw material for the synthesis of technical material can be utilized for pesticide production only if previously registered in the Component Information System(SIC). The application for component registration can be submitted prior to or simultaneously with the application for product registration. The applicant may apply multiple components in a single application and the import, production and utilizing company of a component should register the component even if the component was previously registered by other company. Entities engaged in the production, formulation, sub-packaging, exportation, importing marketing and providing application service of pesticide should register their establishment with the competent authorities at state, federal district or municipal level. The agricultural cooperatives are considered as commercial enterprise. The establishment should be operated under the assistance of legally qualified technicians. Each establishment should be separately registered even if additional establishments are located in the same place and owned by the same enterprise. The importing, exporting, production and formulating enterprises should report the quantity of the pesticide they marketed, imported, exported, produced or formulated to the competent authorities at state level by 31 January and 31 July each year. The rating of substance or formulation into the above toxicological class does not depend on all toxicological parameters in the same classification but is selected on the highest risk classification principle. Pesticides with the same composition and usage as a previously registered pesticide may not be approved if they are more toxic. Pesticide should be used within the recommended scope as outlined on its label and product manual, which is previously reviewed and approved during its registration. Under the criteria by the agriculture, health and environmental authorizes, low risk pesticide can be exempted from agronomic permission requirements. Pesticide empty packages are mandatorily recycled and reutilized in Brazil. Users should return the packages to the original retail enterprise or any collecting center which was accredited by the purchase establishment and licensed by the competent authority of environmental management. The registrant, production and marketing companies are required to collect and dispose the empty packages and disused pesticides gathered from the users. For imported pesticide, the importing enterprise should be responsible for the collection and disposal. According statistics from ANVISA, the number of registration application pending review is almost 6 times the number of applications evaluated. The legislative system is considered outdated and incompatible with global best practices. A proposal to replace Brazil’s Pesticide Law (Law 7802) was drafted in late 2015 and is now being considered by Brazil's Chamber of Deputies. The establishment of a new organization, the National Technical Commission of Plant Protection was proposed with the aid of providing a centralized authority to administrate the registration of new pesticide, including technical product, pesticide for plant protect and environmental control purposes. Several powers now conferred to IBAMA, ANVISA and MAPA will also be centralized to the Commission. A new system of evaluation and registration similar to that implemented in the United States and Canada is expected to be implemented in Brazil.